Five years ago, the Janeway Children’s Hospital Foundation was looking for a new signature fundraising event that could span province-wide, reach young and old, people at school and in the workplace, and most importantly, was fun to participate in. And so … Jamarama was awakened! 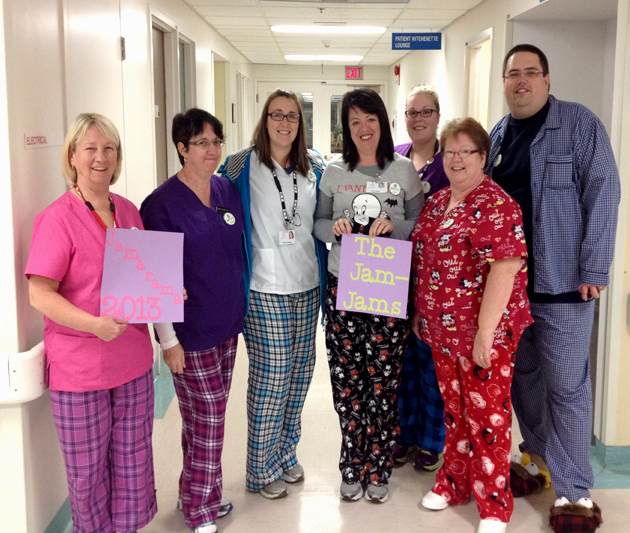 The premise of Jamarama is quite simple … wear your pajamas as a sign of solidarity and support the brave kids in our hospital who don’t get to change out of their PJs! This lets the children at the Janeway Children’s Health and Rehabilitation Centre know that we understand what they are going through in some way, and that we are fighting right alongside them. When it’s a cause that is this important, no one minds looking a bit silly for a day … and raising money can be fun! I’m Phyllis Kinsman, manager of communications and events with the Janeway Children’s Hospital Foundation, and I have been overseeing Jamarama for the past two years. 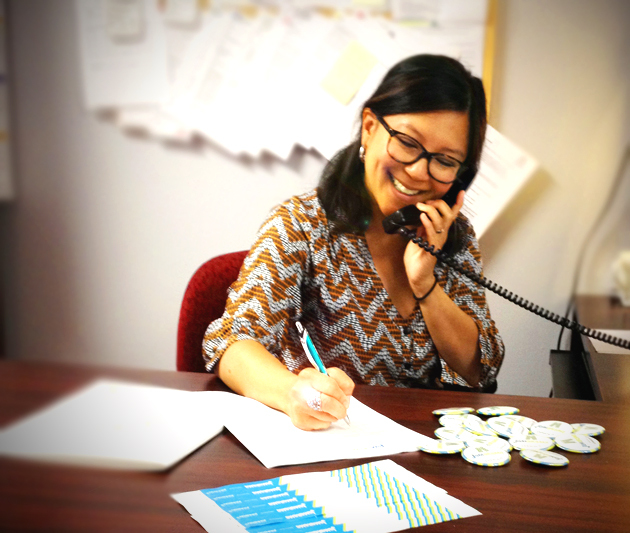 Phyllis Kinsman on the phone with supporters. This year marks the fourth annual Jamarama. Not many people may know this, but a lot of effort goes into getting people in their jammies! Planning for the event starts in early spring, where we look at the previous year to see how we can improve. We always look for fun ways to raise awareness of Jamarama, whether it’s filming a video of Danny Williams in his pajama pants or getting a T.V. spot with Mark Critch at the Janeway! Then we approach potential sponsors, confirm prizing, book interviews with the media, send email blasts to past participating teams, individuals, schools, and daycares, make lots of phone calls to new participants, and much more! As with any big initiative, there are always challenges along the way, but when Jamarama day finally arrives, it’s such a joy and totally worth it! As part of Jamarama, some folks compete with one another, not only to see who can raise the most money, but who can sport the zaniest pajamas! Staff at Burin Peninsula Health Care Centre won the top fundraising team for the last two years! 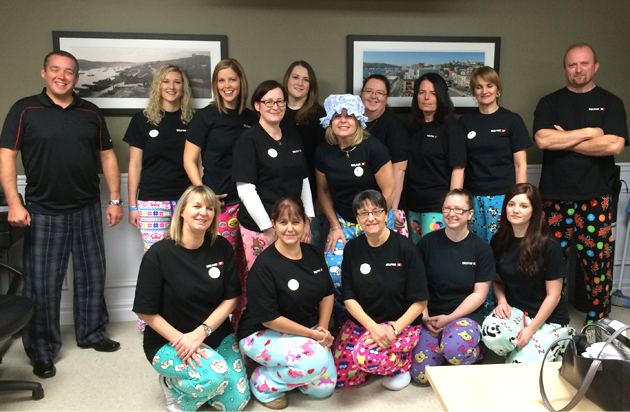 The Jam-Jams of the Burin Health Care Centre were crowned the top overall fundraising team for Jamarama in 2013 and 2014. I am so proud to say that over the last three years, Jamarama has raised approximately $450,000, and has quickly become one of our most important events, with thousands of people from across Newfoundland and Labrador wearing their pajamas to work or school in support of the Janeway. It’s an event that has everyone feeling, literally and emotionally, “warm and fuzzy,” since every donation helps to ensure the children of this province continue to get the best medical care possible, right here at home. As with all events, funds raised for Jamarama offset the financial commitment the Foundation has made to the Janeway for medical equipment, research, education and programs. With Jamarama launching in mid-September, offices, schools, individuals and health care staff can get involved once again! The Janeway Children’s Hospital Foundation is a registered charitable organization that was created to raise funds to meet the financial needs of the Janeway for the purchase of the latest in modern medical equipment, the continued education of Janeway staff and the research and programs that are directly related to the province’s children’s health and welfare. As part of celebrating Jamarama, people share with us some amazing photos on social media networks, using #Jamarama in their post. Adults enjoy it just as much as the kids … and sometimes even more! Team BELFOR Property Restoration from Paradise (2013-14). This story was written by Phyllis Kinsman, manager of communications and events with the Janeway Children’s Hospital Foundation.